With DriveDx you need not worry about losing your important data, music, and photographs. You can know before your drive is going to fail, because DriveDx tracks more indicators of impending failure than any other product on the market for both SSDs and HDDs. You will have more chances to save your critical data before any data loss actually occurs. When evaluating the state of various drives, DriveDx can use different heuristic algorithms depending on the drive model and even its firmware version. Will help to quickly identify if the drive is faulty. User does not need to have physical access to a specific computer all the time, which is especially useful for all kinds of server rooms, data centers, etc. Here's a DriveDx triumph. DriveDx showed my just out of AppleCare iMac with two pre-fail conditions for the hard drive. Made appointment and took it to Genius Bar yesterday. Tech looked at DriveDx and was very impressed. Even though out of warranty - they replaced the drive without question. God knows how many dollars and troubles DriveDx saved me since I had several vital FinalCut projects on it! I just registered my copy of DriveDx. I want to say thanks for saving me a whole lot of time, expense, and aggravation. I’m trying to keep my 2011 MPB running for as long as I can….or at least until Apple gets their act together and starts making 17” laptops again. My Samsung 840 EVO SSD is aging, and my laptop gets very heavy work, managing networks, and saving the world. Lately, the system has been hanging under heavy load. On a whim, I loaded up DriveDx, which told me there were CRC errors on the SATA cable. A $13 cable later, and I am no longer able to crash the system no matter how hard I try. Drive Dx is well worth the $19.99! Thanks a million! As a photographer, I’m always concerned about drive failure because I know it will happen to all of my drives. What I don’t know is when. DriveDx exposes low-level information of internal sensors, pre-fail indicators and lifetime accumulators of information that have allowed me to anticipate problems before they affect my system. As a result, I sent external drive back to LaCie for exchange under warranty due to anticipated drive failure. This is one of the best investments you can make in your system. I recommend it highly. External backup disk will have been gone soon.. It's time for NAS server. Thanks for letting me know @BinaryFruit! A couple of days ago, DriveDx warned me (pre-failing) for one of my external drives. I don't use it any more for backup. After DriveDx warning, drive behaved abnormally, I heard loud clicking noises and I got warnings from OS X as the drive unmounted abnormally while it was not the case. Thanks to DriveDx. Best in its class. Excellent tech support. 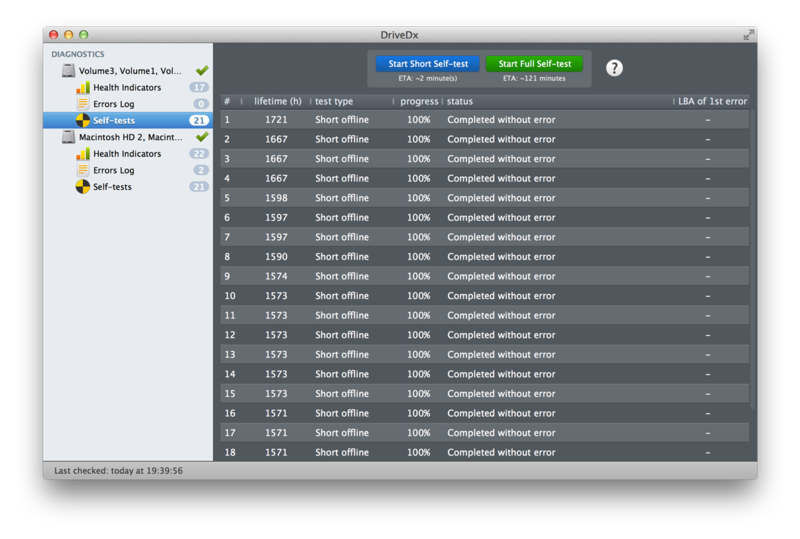 DriveDx just warned of pending drive failure - second time @binaryfruit app has avoided server crash. Shout out to @BinaryFruit for offering a great product and great service over and beyond what they advertise! DriveDX is an awesome app! Cheaper and better than it's main OS X competitors. DriveDx has a better GUI layout, clearer presentation of data, and explanations of each of the SMART attributes. Beautiful. Absolute Must for the OS 'Toolkit'! I was having some serious issues with an SSD hybrid drive on my macbook pro, and well since seagate doesn't support mac, their 'seatools' software was useless (and required) for getting a proper exchange. That one event way more than paid for the price of the software. THIS software generated a report that was acceptable for me to get my exchange, and before the drive died completely. Got my replacement drive and I will most certainly never go back to not having it installed. Just in Time! I downloaded DriveDx and discovered that the second HDD in my MacbookPro (in the superdive location) was having "failing warnings", although DiskUtility said the drive was OK. So I decided that I had to replace it. I did that and enclosed the failing disk in an external enclosure to use it some more. A week later I began to have serious issues with the failing disk and ditched it. I am very happy with DriveDx, worth the money on all accounts. I have a not so supported fusion drive in my Macbook Pro. There has never been any way to see the S.M.A.R.T. status. Decided to give this a try and the first thing that pops up is that my Crucial M4 SSD was close to failure because of a bug in the microcode. I have not tried to use this to look at my USB attached drives, since the only one I have is a small external that I boot from in emergencies. 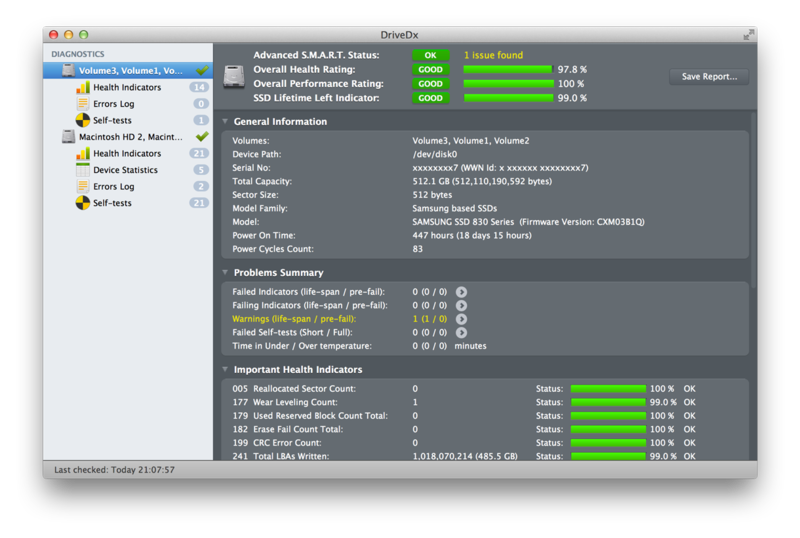 But DriveDx not only clearly sees both drives making up my fusion drive, but it also shows me the status of my 3 eSATA drives. It's finally great to have something even better than Crystal Disk Info to monitor hard drive life signs. Thanks to these features, users can now have a fuller and better understanding of the current state of their drive. DriveDx will protect you from data loss and downtime!